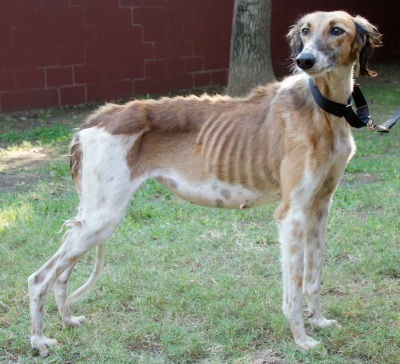 Nancy is an approximately 3 year old red and white female saluki/greyhound who is part of a cruelty surrender of 8 from west Texas on September 21, 2016. Nancy as a positive titer to Ehrlichia Canis, and her treatment will start as soon as a foster home is located. She arrived weighing barely 30 pounds and must gain some weight prior to starting treatment. It appears she has been starved. Nancy should not live with cats; however, she is fine with small dogs (15 lb terriers). Nancy has gained some very much needed weight and is currently at 39 pounds! She is being treatment for the positive titer to Ehrlichia Canis at this time. Her foster home reports she is quite the loving and sweet girl. A DNA blood test is pending. Nancy has completed her treatment for Ehrlichia and has a negative PCR (Polymerase Chain Reaction) test. She has also completed all of her medical procedures. She's ready just in time for Christmas! Nancy is the perfect foster living with 3 terriers and another greyhound. She was crated for the first 2 days and she has had free roam of the house since. She has never had a potty accident or chewed on anything. She loves her humans and is pretty much a Velcro dog who desires nothing more than to be loved on. Nancy is shy and a bit skittish though she has some food and personal space aggression. Quick moves and loud noises frighten her. 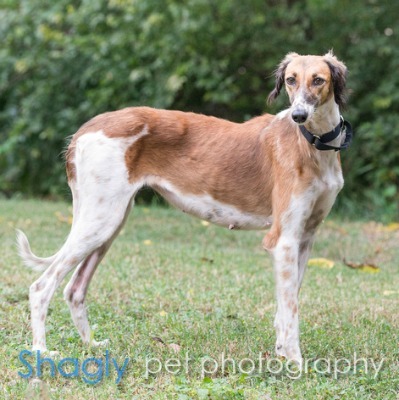 Nancy is a sweet and petite girl that is looking for a family willing to give her lots of love and attention. Don't let Nancy's small stature fool you, she's a jumper! Her forever home should have, at a minimum, a 6 foot fence. The special medical treatment cost needed by Nancy is why the Miss Mesa Fund was established. If you would like to help with Nancy's care, please take a moment to make a donation to the fund. 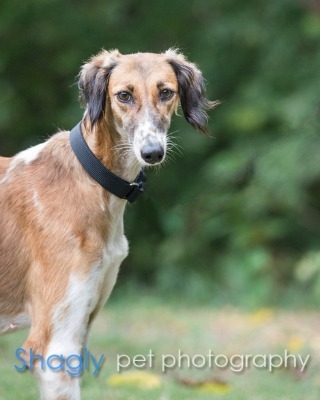 You WILL and CAN make a difference in Nancy's life and the lives of other greyhounds in need of special medical care. Your help and support will make a difference - one greyhound at a time. Please note Miss Mesa Fund/Nancy on your check.